A friend and I are fixing up a Soundcraft 2400 for someone who acquired it from Al Cowan a few years back. I thought it would be interesting for all if we posted our progress on here for people to watch (and so we can fire any questions out into the internets). My friend and I both have some sound engineering knowledge but this will definitely be an adventure into new territory for us. The desk was unused for a decade or two until we fired it up a few months ago; there was a hell of a lot of crackles and pops from various pots and switches, and also a sound that I can only liken to the wind blowing through tree tops. We took the whole thing apart, cleaning every switch and pot with CRC2-26 that someone recommended to us and washing the buttons bringing them back to (almost) brilliant white... While having the PCBs out of the desk and separated we also took the opportunity to check for missing caps, which there were quite a lot of - 10, always C6 or C7, and replace broken switches. When cleaning the group faders we noticed that the tiny (graphite) contacts at the end of the fader ams were missing in a handful of the faders, pretty much 1 from every other fader. For now we have sourced the highest graphite content pencil we could and crafted new contacts. Today we have plugged the desk back in and low and behold, the awful wind through the trees has gone, and only a handful of pan buttons and knobs are crackling. Channel 1's EQ button acts as a high pass filter when pressed, which I'm guessing will be down to some leaky caps? Some inspection is needed. A couple of the groups do not receive any signal from any of the input channels, always the same groups i.e. 4,9 & 11, which I'm guessing is ribbon related. Group 15's VU constantly shoots up and sticks when the desk is turned on, and receives no signal from any input channel when selected. 2 of the input channels only have sound on the left. Luckily though we have a copy of the manual with the relevant fault location diagrams so we'll get stuck into it soon. Well I'd been so busy with this project and a few others that I'd forgotten all about posting on here. Only just noticed my lovely photos didn't show up which is annoying, I will upload photos once I figure out how to get them to show up. The entire desk is almost working now, inputs and groups 1 - 16 are all sounding sweet. The desk has the 24 group monitor upgrade but channels 19 - 24 don't work yet. The PCBs are unlabelled so it'll be fun tracing the problems on those. So the way I understand the wiring should be done is as follows....following the wiring of the DB-25 pinout for #1, + goes to the SEND of channel 1 (EDAC), ground goes to GND, and - goes to SYNC? And then on the return DB-25 connector, + goes to RET, ground goes to GND, and - also goes to ground? So there are 3 connections in each DB-25 connector, and with two of those that is 6 pins to into the EDAC for each channel. I have tried a few different wiring combinations and cannot get sound back into the desk from Logic once I have recorded. I am just wondering if this is an issue with the desk and not with the wiring of the EDAC? SEND is console output to tape. RETURN is tape output to the console. SYNC is a dedicated signal available on high-end tape machines. In the world of Pro-Tools / converters / digital storage, SEND and RETURN are the only signas of use to you. The 2400 audio I/O for the tape machine interface is unbalanced. Thanks Gareth. I was just asking the noob question because some of the signals weren't returning back into the desk and I wanted to double check that it wasn't a problem with the EDAC and therefore a problem somewhere in the desk. I know the SYNC pins are not needed unless using a tape machine (we will be installing one once we've got this lot running) but the cables we ordered were already made up with RM25s and had the SEND, SYNC and RETURN pins so I thought wiring them in instead of leaving them loose wouldn't hurt. The EDAC wiring sheet in our 2400 manual is labelled as a S1624 Varelco Tape Machine Interface, I'm guessing the 1600 series and 2400 share the same tape out wiring seeing as the 2400 was a direct upgrade from the 1624 series? Seeing as you have a rich history with Soundcraft I wondered if you could shed some light on an observation of ours? The PCBs for the 24 track monitor module (SC1220 & 1221) seem to almost have been designed as an afterthought, the board has tracks on the front and back and none of the components are labelled, making it rather difficult to trace problems with it. 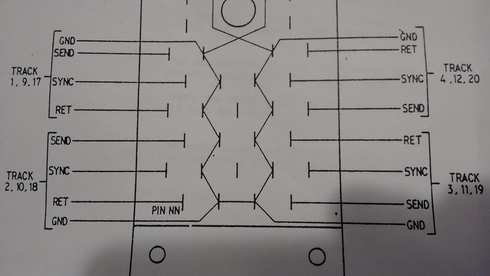 The schematic also shows no earth points for the boards in question, however it seems the previous owner has soldered earths onto the first board (groups 17 - 20) but soldered none onto the second board (groups 21 - 24), what would be the reason for this? Upon plugging in the EDAC cables we can now record onto Logic (hoorah) however we are not getting audio back into the desk on all channels when it is put into remix mode. One of the channels receives the audio signal, and the channel will peak when the gain is turned up however there is simply no audio output from that channel. I can take a line out on the patchbay and send it to another channel and there is signal, just nothing comes out of the channel itself? Odd. And there are 4 other channels where there is simply no audio present in the channel (the peak light does not illuminate when gain is added). I can take a line out from the desk oscillator into the line input of these channels and lo and behold, there is the oscillator.... So why on earth is there no signal coming back from Logic Pro? I have checked and re-checked the pin wiring in the EDAC. Original 2400's had a poor grounding layout. I measured a -55 db S/n ratio on one with my Audio Precision analyzer many years ago. Soundcraft printed out a grounding mod for those to correct that. It was about a $3500 job back in the early 1990's to do that. It requires cutting all the input grounds on each input module and running seperate ground wires. The same work is done on all the patch bay cards. Contact Soundcraft for a printout of those mods, every 2400 without them needs it. From what you"re saying I would guess that this desk has definitely not had the grounding mod done. The input channels are all individually grounded to the base plate, which is then connected to a star point. However the patch bay has no signs of grounding cables at all. There are so many ribbons inside the patch bay I'm surprised there's even room for more wires under there ha. I've noticed a few of your posts in other places on this forum (and other forums) about the grounding mod and also recapping and changing out op amps, and we will definitely give the desk those much needed upgrades, but before any of that can be done we still need to get the entire desk to actually work.... The aux sends all sound as if they have a high pass filter on them. Only half of the channels come back into the desk from the A/D converter when in remix mode. And we have a band coming in next week. Panic is on the horizon....Fun times. After more reading I'm thinking it is perhaps time for a recap of the PSU too, seeing as the desk is nigh on 40 years old and apparently has never been done. Any help at this stage would be greatly appreciated, thanks! After doing some more reading and Googling, I must say, it is an honour to be talking to mod royalty. I just took the master channel out and had a look at the Aux section. It would appear someone has changed pretty much every cap and resistor in aux master 1 & 2 circuits with very different values from the schematic, just wondering if you have any experience with AUX master mods on the 2400s? I will go through and test all of the components values and post the details in an hour or two, just off on some errands first. Well, that was an ordeal. Those errands weren't supposed to take nigh on 11 months. I'm still no closer to solving the mystery behind the Aux Master components. I've learnt a lot about the desk (and myself) over the last year, but my electronics knowledge is still basic. Probably could've read some books and taught myself in the space of a year, perhaps in the next year I will. The desk's sounding good, have done plenty of recordings on it. Nothing has exploded or caught fire, result! Turns out someone did half of the grounding mod, they didn't cut the original grounds or run wires to the patch bay cards. I've emailed Soundcraft about the mod multiple times but they have no records of the mod spec sheets, but it seems straight forward enough. Just feels wrong to deface history. The ground loops caused by the extra earth cables seem to manifest in the Auxes, the only noticeable hum is sent to the aux masters, odd. We are still only running 16 groups, the 24 track monitor strip was taken apart by someone else and remains in pieces. I haven't added LEDs to the VUs yet, thats on the jobs list.